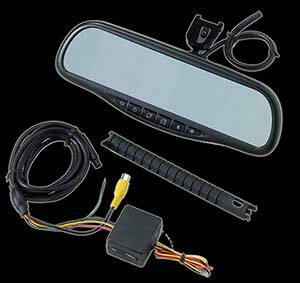 The Advent NM100 replacement rearview mirror provides a truly cost-effective navigation solution for almost any vehicle! The NM100 comes with built-in iGo Primo Navigation with 3D mapping (the same system that is supplied in their “OE” navigation systems), a built-in handsfree Bluetooth system with phone book accessibility as well as a 4.3-inch LED backlit digital monitor with touch screen. This system includes internal microphone, speaker and GPS antenna as well as universal GM/Ford/Chrysler windshield mounts. Bluetooth Mode: Bluetooth can connect to one phone at a time, and can dial from the phone, from the mirror’s touchpad, or from the call history list in the mirror. Rear Camera Mode: Can be paired with any display any standard rear camera, allowing camera operation in reverse, or can display factory rear camera if previously displayed in factory mirror (additional labor may be required). 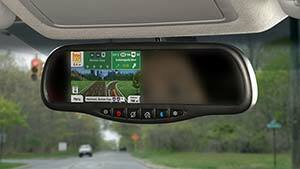 Aftermarket camera can also be wired as a “lane change” camera, allowing camera display to be switched on demand while driving (additional labor may be required).